Are You Creating Branded Video? If Not, Where Have You BEEN? The following blog was inspired by my friend Rick. Since the days of MTV the video revolution continues to catch on; but now the old school Run–D.M.C. and Beastie Boys’ music videos have been replaced by more splashy content used to promote products and films such as the new video featuring everyone’s favorite anchor, Ron Burgundy. And by the way, MTV also has been replaced by YouTube, the former home of the poorly produced mobile videos and talking cats. And just in case you have been living under a rock, YouTube has become the go-to site for video on the web. With its award-winning producers, publishers, programmers, and performers from traditional media who deliver a variety of streaming videos, today’s YouTube has become more like YouTV by engaging traditional TV in a fight over screen time. 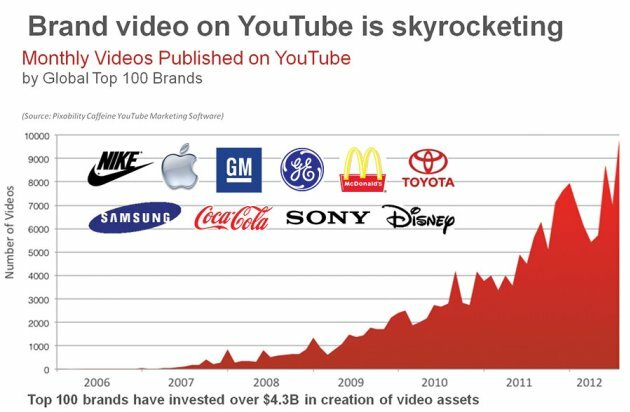 In addition, YouTube has grown from 344 million unique users to 500 million through branded channels and advertising dollars. According to Interbrand’s Top 100 shows, YouTube video production has increased from 4,760 videos per month to 7,175 per month, with a total production value of more than $4.3 billion. One hour of video is uploaded to YouTube every second. However, the best thing about YouTube is that you also can watch the entire catalog of old school Run–D.M.C. and Beastie Boys’ music videos from your desktop at work. Procter & Gamble/Old Spice: 373,350,360 views, released in 2010 as part of the “The Man Your Man Could Smell Like” campaign. Volkswagen: 180,273,963 views, “The Force” ad from a couple of years ago is one of the most-viewed web ads of all time.